June 11th, 2010 07:25 AM | by William Bell | Parables. Matthew 22 contains the Kingdom Parable of the Wedding Feast. In these fourteen verses, much about man’s relationship to God is summed up in this parable. Additionally, it is definitely an end times parable having much to say concerning the wedding feast. The reader should notice that this kingdom parable is a direct commentary on Ephesian 5:23f and Revelation 19:7-8, where the marriage of the Lamb comes at the fall of Babylon. More on this later. However, they made excuses, even to the point of ridicule. Others, violently seized his servants, treated them spitefully and killed them. See also the kingdom parable of the vinedressers in chapter 21. When the king hears the news of how his ungrateful guests violently attacked and killed his servants, he sent out his armies, destroyed those murderers and burned up their city. Following this, his servants went out into the highways and bid as many common folk they could find to come to the wedding. The scene here is historically accurate. Jesus predicted the destruction of Jerusalem by the Roman armies. The reason for their destruction was Israel’s rejection of God’s invitation to come to the wedding feast, i.e. the marriage of the Lamb. Because they rejected Christ, they were not disposed to attend the wedding feast. Further they persecuted and killed many of the servants (apostles and New Testament prophets/teachers) God sent urging them to repent. True to the prophecy, God sent the Roman armies against Jerusalem, destroying it in A.D. 70. Kingdom parable messages almost always focus on this common theme. However, after the city was destroyed, the time came for the wedding feast. This demonstrates that the wedding occurred when Jerusalem fell. This is a direct parallel to Revelation 19. After Mystery Babylon is judged and falls, the marriage of the Lamb immediately follows. This can only mean one thing, namely, that the wedding feast of Revelation 19 equals the wedding feast of Matthew 22:1-14. In both a city is destroyed. In both the wedding arrives after. In both it is the wedding of the son of a king. This proves that the events of Revelation, the main thesis of which is the destruction of the harlot city, Mystery Babylon and the Wedding Feast, occurred in A.D. 70. Does Christ Have Two Brides? Unless Christ has two brides, these cannot be separate events. The Lord only has one bride, the church, (Rom. 7:4, 2 Cor. 11:2; Eph. 5:32; Rev. 19:7-8; 21:9f) Therefore, the kingdom parable of the wedding feast of Matthew 22 is the same as that in Revelation 19:7-8. 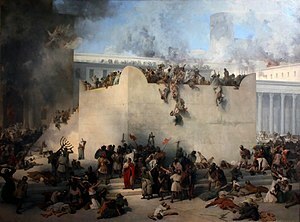 It proves the second coming of Christ occurs at Jerusalem’s fall in the first century. During the feast, they took notice that one had entered without a wedding garment. So he was questioned as to how he managed to come in improperly attired. According to Revelation 19:7-8, the wedding garment is the “righteousness of the saints.” God makes man righteousness through Christ and obedience to the gospel of Christ (Rom. 1:16-17, 10:4). Thus, here was a man attempting to gain entrance to the feast as an unbeliever, unwashed and therefore not cleansed in the blood of the Lamb. Note also that this could not be an end of the planet scenario. This parable is a refutation of the world destruction paradigm of futurist eschatology. If the world were destroyed according to them, how does this unbeliever survive a fiery destruction to enter the feast? Perhaps the “fervent heat” burned all his clothes off, but left his body perfectly unscorched or untorched!?! Life goes on after Jesus’ return and the wedding feast. We all are here today to prove it. The kingdom parable of the wedding feast clearly demonstrates the first century fulfillment of Jesus’ union with His bride, the church.